Chilly crags, half-frozen trails and backcountry powder are all equally fine playgrounds for Patagonia's R2® Jacket. 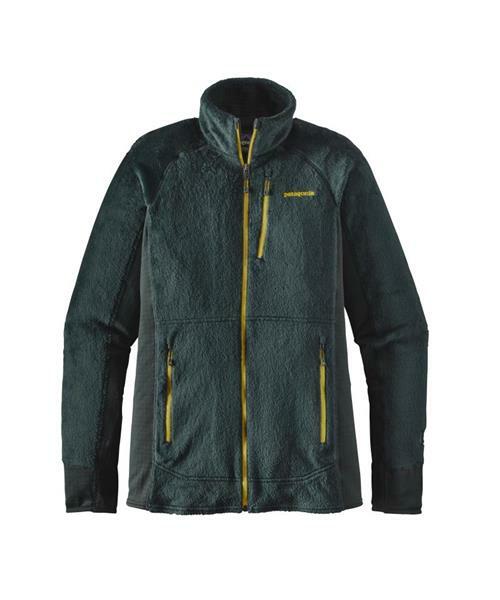 This Regulator® fleece jacket's highly refined construction and fabric traps heat and breathes freely, with its main body relying on high-loft Polartec® Thermal Pro® recycled polyester fabric, which is superlight, wicking, compressible, stretchy and soft. The remapped R1® Polartec® Power Grid™ high/low grid panels now wrap each cuff, then run along the underside of the arms and down the sides to improve fit, mobility and comfort range. The new cuff design employs a spiral-stitch construction that won’t constrict your forearms when you push up the sleeves; the softly lined inner collar and kissing-welt zipper garage go easy on the neck and chin; Sonic/Stitch seam construction on all zippers reduces bulk; offset shoulder seams stay clear of pack straps; zippers close the external pockets (one chest and two handwarmers, above harness line), while the handwarmers’ pocket bags double as stealthy internal mesh drop-in pockets.